Acute Myeloid Leukemia (AML) is a rapidly progressing cancer of the blood characterized by the uncontrolled proliferation of immature blast cells in the bone marrow. The Leukemia and Lymphoma Society estimates that over 13,000 new cases of AML were diagnosed and approximately 9,000 deaths from AML occurred in the U.S. during 2007. AML is generally a disease of older adults, and the median age of a patient diagnosed with AML is about 67 years. A majority of elderly patients are not considered candidates for standard induction therapy or decline therapy, resulting in an acute need for new treatment options. Acute erythroid leukemia is a high-risk cancer with a dismal prognosis, uncertain genetic basis and controversy surrounding the diagnosis. That is changing, thanks to research led by St. Jude Children's Research Hospital that appears today in the journal Nature Genetics. The prognosis for older patients with acute myeloid leukemia is poor: very few achieve remission and for those that don't the option is largely palliative. Cancer cells consume sugar at a higher rate than healthy cells, but they're also hungry for amino acids, the building blocks of proteins and other biomolecules. Acute myeloid leukemia is the most common form of acute leukemia. It is characterized by an increase of malignant myeloid progenitor cells at the expense of mature blood cells. Leukemia promotes premature aging in healthy bone marrow cells - according to new research from the University of East Anglia. The abnormal expression of different classes of molecules is known to be linked to various types of cells becoming cancerous. 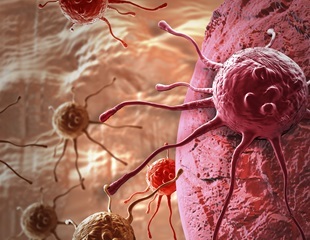 A mechanism which drives leukemia cell growth has been discovered by researchers at the University of Sussex, who believe their findings could help to inform new strategies when it comes to treating cancer. An active ingredient in eye drops that were being developed for the treatment of a form of eye disease has shown promise for treating an aggressive form of blood cancer. Scientists at the Wellcome Sanger Institute, University of Cambridge, University of Nottingham and their collaborators have found that this compound, which targets an essential cancer gene, could kill leukemia cells without harming non-leukemic blood cells. Advances in rapid screening of leukemia cells for drug susceptibility and resistance are bringing scientists closer to patient-tailored treatment for acute myeloid leukemia. More than 30 abstracts presented at the 60th American Society of Hematology Annual Meeting & Exposition in San Diego, December 1-4, featured research highlighting the ability of Bio-Rad's Droplet Digital PCR to provide high sensitivity and accuracy in quantifying minimal residual disease -- those remaining cancer cells after therapy that are associated with relapse -- in blood diseases such as leukemia. At the American Society of Hematology Annual Meeting, Cleveland Clinic medical hematologist and oncologist Aziz Nazha, M.D., will present results of a personalized prediction model that surpassed current prediction models for Myelodysplastic Syndromes. Researchers from the Princess Máxima Center for Pediatric Oncology have shown that the number of mutations in healthy and leukemic blood stem cells does not differ. While it has long been recognized that mutated gene NPM1 plays an important role in acute myeloid leukemia, no one has determined how the normal and the mutated forms of the protein NPM1 function.